You don’t have to be a professional event planner to plan a successful professional event. While we can’t put your client presentation together for you or stuff swag bags, we can help make sure all your guests are well-fed and have enough to drink. Follow these (simple!) formulas so you can spend the event day joining in on the fun. We’ll drink to that! Most guests will have two drinks in the first hour and one per hour after that. So for a two-hour event multiply the number of guests by three, and so on, to determine the number of drinks you’ll need to serve. Wine is a good drink of choice for short, formal events. Keep in mind that one bottle of wine contains approximately four glasses. Serve both beer and wine if you are throwing a more casual event. 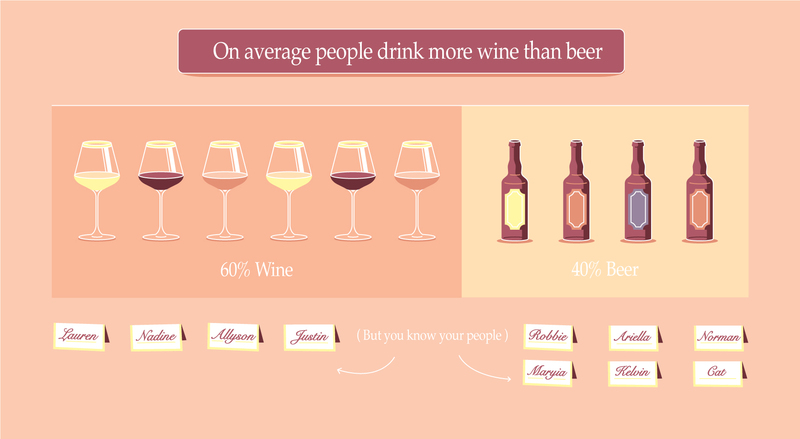 Typically about 60% of guests will choose to drink wine, and 40% will drink beer, but this varies depending on the crowd. Include cocktails if you want to take your gathering from reception to full-fledged party. Keep in mind this will require more ingredients and more skilled bar staff which means more from your budget. There are about 20 servings in a bottle of liquor, so for smaller events consider having just one signature cocktail on hand. Give it an inspired name, and it will feel celebratory instead of frugal. 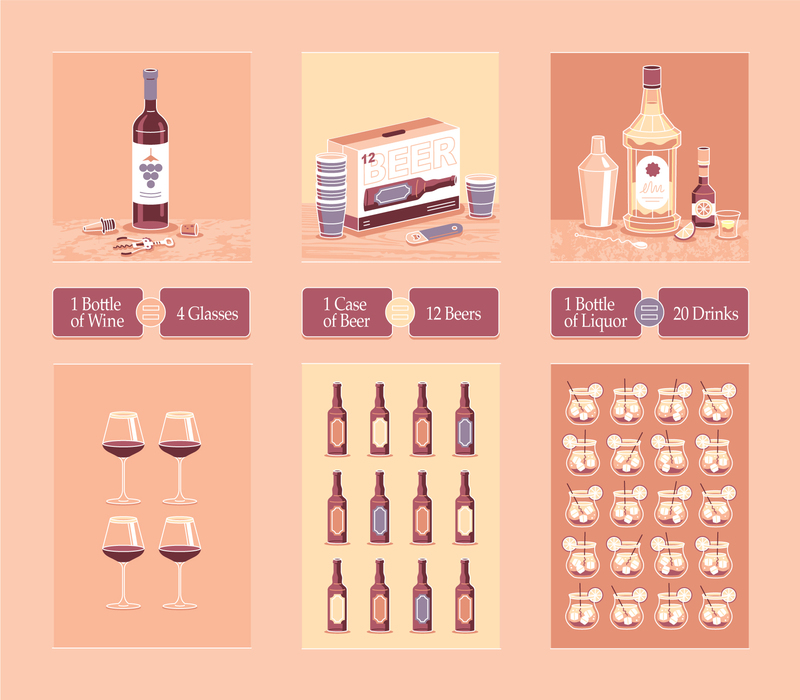 Plan for an even split of wine, beer, and cocktail lovers from your partygoers. Have sparkling water, soda, or a special non-boozy drink like Seedlip available for those who aren’t drinking. There are more non-drinkers than you might assume, and providing alternative beverage options will not only help them feel included and comfortable, it will also help mollify any issues you may have with guests who allow themselves to be “overserved” too early in the night. You will need ice for drinks as well as keeping bottles and cans cold. A good rule of thumb is to order 1.5lbs of ice per guest. Level up the look and feel of your event while doing a little good for the environment by renting glassware instead of using disposable cups (read more on that here). Hors-d’oeuvres are a smart choice because they are easily plated or passed, guests can eat them standing up, and they don’t require silverware. Serve a mix of hearty and lighter options, meat and vegetarian-friendly options, and a combination of textures and colors. If you’re handling the catering yourself and stick with room temperature noshes. Add nuts, olives, pretzels, or crudités to round out the culinary offerings. We love celebrity-caterer Annie Campbell’s tips on creating platters. Passing a dessert option at the end of the event is a nice subtle way to hint that things are winding down. When you start to run low on sweet bites, clear them instead of replacing them to help imply that guests should start finding their way home. 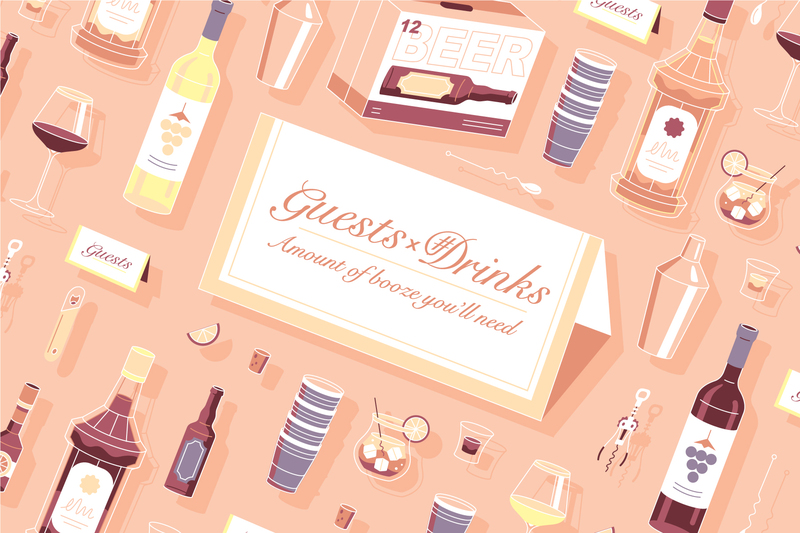 Now that you can check food and booze off your list, find the invitation that matches your professional party’s style.